Russian-Polish rabbi; died at Kutno, in the government of Warsaw, July 11, 1893, at an advanced age. He studied in the yeshibah which was founded in the village of Kukhari by R. Solomon Posner about 1835. Israel Joshua and R. Ḥayyim Wasserzug (Filipower) were the most famous graduates from that institution, which was an adjunct to the agricultural colonies Posner had established on his estates. Israel Joshua occupied various small rabbinates up to 1860, when he became rabbi of Kutno, which he consistently refused to leave for larger rabbinates to which he was invited from time to time. By many he was considered the greatest Talmudical authority of Russian Poland. 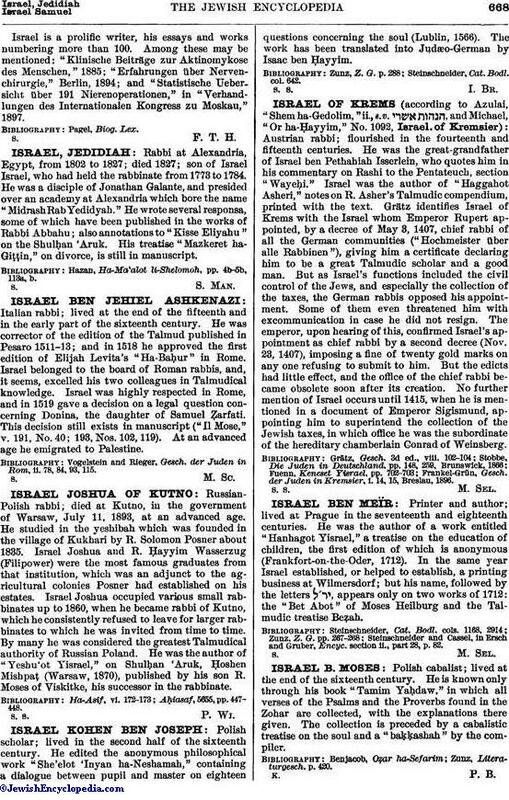 He was the author of "Yeshu'ot Yisrael," on Shulḥan 'Aruk, Ḥoshen Mishpaṭ (Warsaw, 1870), published by his son R. Moses of Viskitke, his successor in the rabbinate.